The Roundtable LED 55" is finally here! The Ginza features all of the benefits of our classic round table but has all of the flash and sophistication of our best selling Lumen HD table! The Roundtable comes with our thoroughly modern Melvin pedestal leg in a classic black gloss finish, features 4" stainless steel cup-holders, has a chip-resistant flat black laminate racetrack, and of course, comes with remote-controlled LED lights that go from red to green to everything in between! 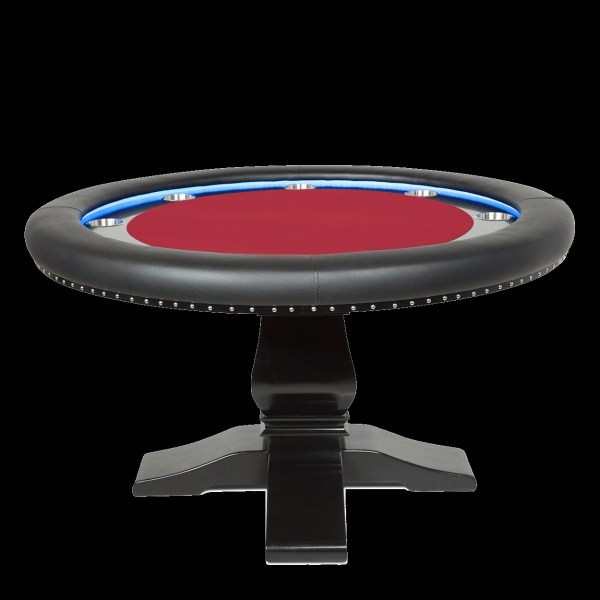 The Roubdtable Illuminating Table is also available with a matching round dining top in our classic black gloss finish. All of our dining tops have wooden pegs on the underside that allow for the dining top to rest in the cup-holders to prevent any dents in your armrest and playing surface. All tables come with our industry’s best 1 YEAR WARRANTY and free shipping! Some assembly required.